The following are a few of the highlights and the WordPress news you can use. As reported by Weblog Tools Collection’s Mark Ghosh, FeedBurner has been taken over by Google and FeedBurner users are required to transfer their FeedBurner feeds, or check to ensure they have indeed been transferred, as he found out recently that his weren’t. Feed must be transferred as of February 28, this weekend, to the “new” version of Google FeedBurner. WordPress 2.7.1, a maintenance release, is out. If you are using WordPress 2.7, take advantage of the automatic built-in upgrade. If you are not, then consider upgrading to WordPress 2.7. Sixty-five files were modified with 68 bug and feature fixes and improvements, and I covered more details about the release on my blog. F-Secure reports there is a security vulnerability with Adobe Flash, specifically a Adobe Flash Player remote code execution vulnerability which impacts several versions. Many WordPress Plugins rely upon Flash, as do many WordPress blog. It is recommended you upgrade Adobe Flash accordingly. I report on a lot of various WordPress events including WordCamps and WordPress Meetups around the world. Check the Blog Herald WordPress News for a WordPress event near you. WordCamp Denver is this weekend and for the most part, is sold out. I’ll be attending and working with Dave Moyer of the WordCast Podcast to do live podcasting and video interviews during the event. Hope to see you there! The Logo Design Contest Winner for WordCamp Toronto 2009 is Paul Morrison, a student at Seneca College Digital Media Arts student. This is a great way to involve the community in a WordPress event. WordPress Meetup or WordCamp Near You? 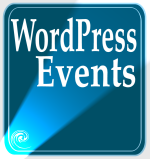 If you are putting together a WordPress event, please email me so I can publicize it here. If there is a WordCamp near you, go. If you are interested in setting up a WordCamp, stay tuned for news and information on to bring a WordCamp event near you. This entry was written by Lorelle VanFossen and posted on February 26, 2009 at 5:37 pm and filed under WordPress, WordPress News, WordPress Tips with tags how to use wordpress, security, vulnerability, wordcamp, wordpress, wordpress event, wordpress help, wordpress meetup, WordPress News, wordpress plugin, WordPress Themes, WordPress Tips, wordpress tutorials, wordpress upgrade. Bookmark the permalink. Follow any comments here with the RSS feed for this post. Post a comment or leave a trackback: Trackback URL. I went to Seneca College for Digital Media Arts. In fact Brendan from Phug Culture was the teacher who taught me both flash and WordPress. He started Phug (I am one of the original members). Now depending on how you see this….Brendan gave you a blessing (or torture) that is me. By the way…………..there is automatic upgrade notifications for plugins and WP core files……will 2.8 finally have that for Themes? Plugins have had an advantage for years, now it’s the THEME ERA. How do you decide on which WordCamp events to go to as attendee or presenter (what if two events ask you to do a presentation). I would love to go to some of the WordCamps but coming from Toronto to New Orleans, Las Vegas, Denver……It is expensive. Plane: $1,145 Toronto-Columbus (OH), yet if I would go via bus to Buffalo then go from Buffalo to Columbus (OH) it would be $245 (the whole domestic vs. international thing). I don’t see me travelling for a few hours by plane (or a lot more by bus) for just one day then travelling a few hours (or a lot more by bus) to go back. All the WordCamps that are coming up that have their speakers on their websites have at least one that I would want to see. Obviously I would go to one where I see your name..or maybe not. I am watching American Idol and I will make up my mind after. There was the WordPress meetups for January and February but the admin (the guy who organized WordCamp Toronto 2008) resigned for the group. How do I go about starting a Toronto meetup group? Last question: WP.com has a script that turns all lowercase p from WordPress, is there anywhere I can download it for my wp.org site? I know in phpbb there is a censor section where it changes all references of the F word to #$@! or , maybe use a censor plugin for WP to make it WP and not Wp? @Miroslav: Yes, as has already been pointed out, there are Plugins that will change the p in WordPress to capital. And there are also WordPress Plugins that will censor comments so only polite conversations will ensue. Look for censor comments WordPress Plugins to see what’s available. They are a bunch and they do all kinds of different things. Thanks for all the links and info, makes it easier to follow. The camp just happened in India. It was a great success. Looking forward to more about it.